(CNN) -- A British backpacker has been rescued after spending nearly two weeks missing in the mountains of eastern Australia, authorities said Wednesday. 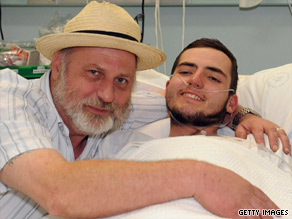 Jamie Neale recovers in a hospital bed in Katoomba, Australia, with his father Richard Cass after his ordeal. Jamie Neale, 19, was last seen July 3 after leaving his youth hostel in Katoomba, in the Blue Mountains west of Sydney. Two hikers found Neale near a trail outside of Katoomba, police said. New South Wales Police said Neale was taken to Katoomba's Blue Mountains Hospital suffering from exhaustion and dehydration. His father said Neale ate seeds and weeds to stay alive, but was starting to give up hope that he would survive. "He was kind of losing faith in the idea that there was a God every time that helicopter flew over and he waved and shouted and nothing happened," Richard Cass told reporters. "He did think he was going to die. He was that scared." Cass said he also started to lose hope that his son would be found alive. He said he even held a private ceremony in the mountains to say goodbye, burning a candle and burying a red rose to mark Neale's English heritage. Cass was already in Australia, having flown from Britain to help search for his son. He was about to board a plane back to Britain on Wednesday when he got the call that his son had been rescued. "I heard the news and I gave a great shout, 'My boy's been found!'" he said. "It was great." Neale has scratches and looks a bit gaunt, but is otherwise doing well, his father said. Video of Neale recovering later in Katoomba Hospital showed him alert and smiling occasionally at his father. There, his father stood over his son's bed and jokingly chided him about his lack of preparation. "This is how to get lost in the bush: Leave your phone behind, don't tell anyone, don't phone anyone, don't sign the bush register, wear dark clothing. I mean, Jesus Christ, Jamie," his father said with a smile. "Oh, and if you've got a space blanket, leave it behind in Perth." The Blue Mountains are a densely wooded landscape popular with tourists and hikers. They cover 250 million hectares (965,000 square miles), and walking trails alone stretch more than 250 kilometers (155 miles), according to Inspector Carl Clark of the New South Wales police. The terrain is so rough and remote that search teams had to be sent in by helicopter some days, Clark said. "It's just such a wilderness that it's a fantastic effort to survive a few days, let alone 12 days, in that sort of environment," Assistant Commissioner Denis Clifford said. That wilderness is on the doorstep of the hostel in Katoomba where Neale stayed before he disappeared, Janet McGarry of the Youth Hostel Association told Sydney radio station 2GB.